with the PH range from 7 to 9 which is the recommended optimal drinking level. Advanced and Smart Designed Electrodes:- The KYK ionizers features 5 to 9 platinum coated, 99.99% titanium, durable plates. These plates are highly engineered electrodes design matched with proper power density. The highly efficient electrodes specially engineered to deliver maximum efficiency with excellent performance. The KYK ionizers offer the perfect match of electrode design and superlative power to run them. Besides making water more alkaline, this model also has a built-in water filter. Flow Control System:- For efficient PH, ORP and hydrogen performance it is important that the flow rate must be optimal. KYK ionizers allow easy and meticulous control of the flow rate. The system provides an LCD display and adjustable faucet. Allover Cleaning System:- KYK ionizers clean automatically every time it utilized. Cleaning is an essential step in the whole process as it ensures that the most critical component of an ionizer i.e. electrodes is free from scale. The scale is harmful ionizers, performance can be affected if scale build-up on electrodes. KYK offers best cleaning system for efficient performance over time. 5 years warranty:- KYK is highly dedicated quality customer satisfaction and tech support and provides full 5 years warranty. A clear view:- The Kykindia ionizers feature touchscreen LCD display that makes it very convenient, and it also shows real-time information on the water as it is being processed. A clear view of PH and ORP to keep a track of the water that is taking terms of PH range and ORP levels. it clearly shows that the ionizer is producing reliable results, a very reassuring characteristic. 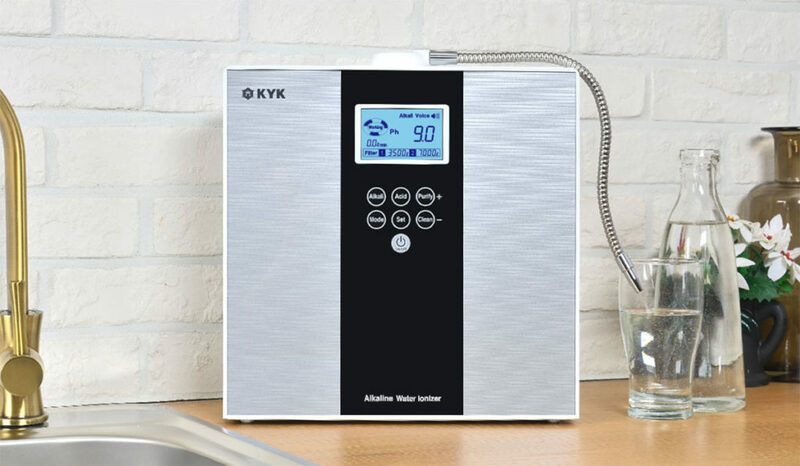 Best value:- The Kykindia ionizer is one of the most reasonably priced units in the market. The price absolutely determines its overall value. Health benefits:- Alkaline h20 has many health benefits and that was proved by many scientific studies. It is known to serve as a great anti-oxidant. It also balances the pH levels in the body and promotes better hydration. Alkaline h20 helps boost the immune system and helps cure chronic diseases. Increase in energy:- Alkaline antioxidant water improves the absorption of nutrients, cleanses the body and prevents accumulation of heavy metals, toxins, and free radicals. Alkaline water also helps you to sleep better at nights and rejuvenate in the mornings. After drinking alkaline water for few months you feel you have more energy. Easy installation:- The installation of our ionizers are actually very easy. Especially for the countertop units. No tools are required, and it can all be finished in just a few minutes.